Approximately 27 species in Santa Cruz County. Any one who has spent time learning to identify mushrooms has probably run across fearsome language about the genus Cortinarius. Although they are extremely diverse (the largest genus of gilled mushrooms on Earth, with over 1,000 species) and often difficult to identify, they are often rather beautiful and satisfying to work with. The morphological diversity of fruitbodies within the genus is stunning; comprising forms both sequestrate and gilled, tiny and enormous, dull and brilliantly colored. All are ectomycorrhizal, forming associations with both hardwoods and conifers as well as some woody shrubs. 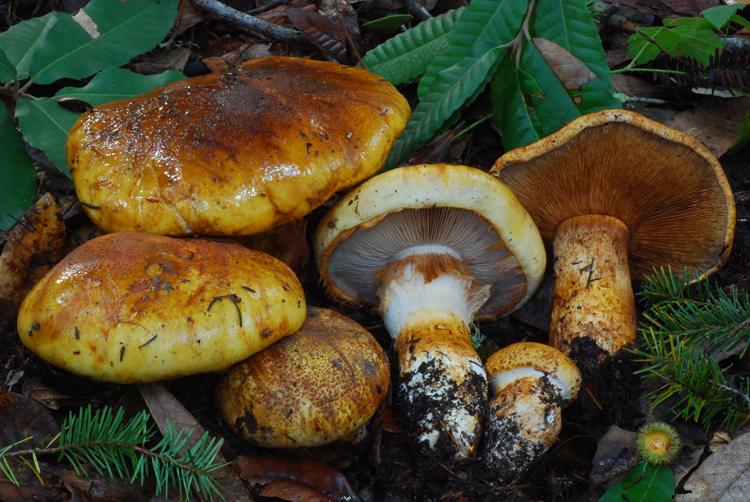 To make the task of identifying a Cortinarius less overwhelming, it is extremely useful to learn to recognize the subgroups below. Keep in mind that not all of these groups are 'natural' (they are not necessarily phylogenetically supported), and not every species will fit neatly into these groups. Phlegmacium – cap viscid, stipe dry, often brightly colored. Some have very distinctive KOH reactions. Myxacium – cap and stipe viscid (although sometimes the stipe is only slightly viscid). Often brightly colored. Usually indistinct KOH reactions. Sericeocybe – silvery silky-capped species with pale blue to lavender or lilac tones, not strongly hygrophanous if at all. KOH reactions usually lacking. 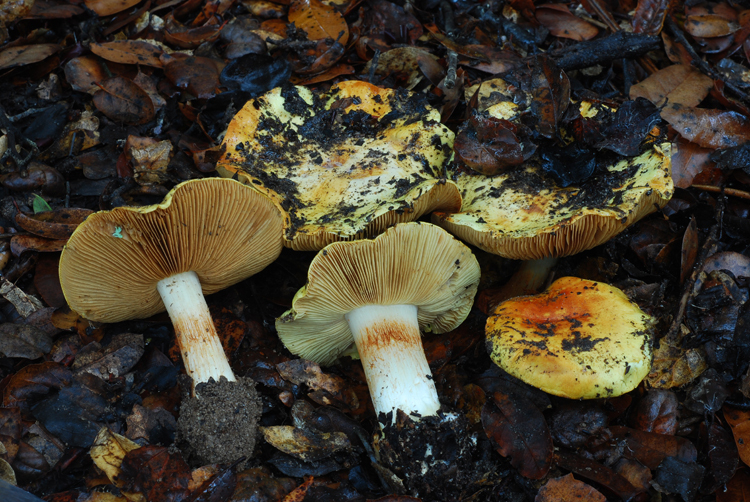 Dermocybe – sometimes treated as a full-fledged genus, these are relatively distinctive yellow, orange, red or brownish species with thin stipes, not hygrophanous. Very strong KOH reactions. 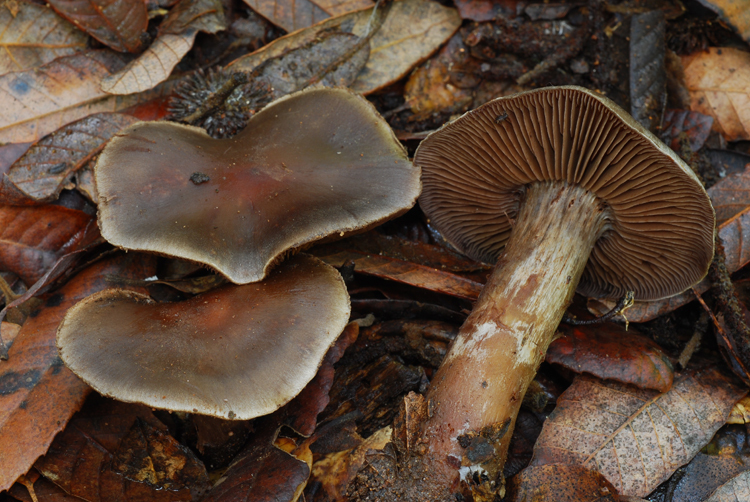 Leprocybe – scaly/scurfy-capped species with dull yellowish to brown pigments; some are extremely toxic. KOH reactions usually lacking. Telamonia – cap and stipe dry and smooth or silky-fibrillose, cap hygrophanous, most are brownish, a few with bright red colors. KOH reactions usually trivial or not distinctive except in those species with strong red pigmentation. 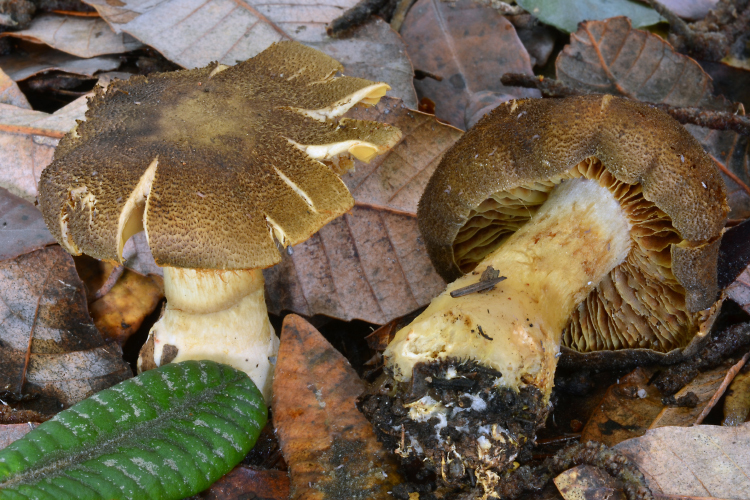 In Santa Cruz county, Cortinarius are not commonly sought out for being good edibles. However, many more species are likely edible than was once thought. 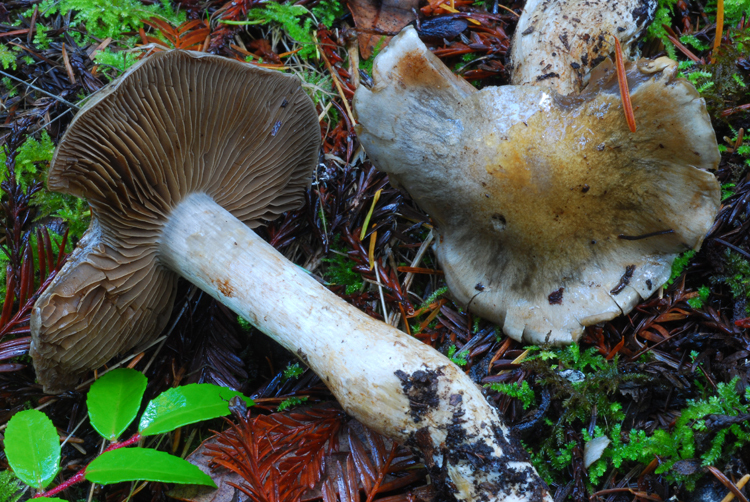 Keep in mind that at least a few are deadly toxic (mostly Leprocybe), although representatives of this group are very rare or absent in our area. Important identification characters include coloration when young as well as in age, texture (dry or viscid? smooth or scaly? ), shape of the stipe base, odor, KOH reactions on all parts, bruising reactions, and host tree species, as well as many microscopic characters.